I love like these super easy recipes and that too with leftover bread slices. The best way to clear out the leftover bread. No need for Gulab Jamun mixes any more. When ever u have left over bread, you can give a delicious make over to them. My son and me finished almost all jamuns and had even not allowed them time to soak in sugar syrup. My kid was asking for more and more. Same thing will happen when u prepare them at your home for sure. You could make this with any left over bread you have it in fridge. Take the bread slices and trim the brown edges. Take the milk in a broad bowl and dip the bread slices one by one and squeeze well the wet slices to remove the moisture from it. Add the squeezed bread slices in a blender jar and add the milk powder with it and grind as a paste to get a uniform mixture. The mixture will be slightly sticky but if you roll them on your palm it should not stick to your palm. In case if it sticks tear a bread slice into small pieces and add without dipping into milk then pulse again to grind well. Take a small gooseberry sized mixture and roll as small smooth surfaced ball without any cracks on surface. While rolling on your palm roll smoothly do not give pressure else your jamuns turns hard. Like wise make 10 big sized or 15 medium sized jamuns. Heat oil in a pan on medium flame till hot. Reduce the flame to low and start frying the jamuns. Do not keep the flame to medium or high, because the outside only gets cooked and the inside stays uncooked. Infact at times the surface of jamuns would get burnt at high flame. Heat the sugar syrup and put off the gas immediately transfer the warm jamuns into the sugar syrup for soaking around 4-5 hours. Fry the bread balls in low flame or medium low flame never fry them in medium high or high flame. Add 1/4 teaspoons of baking soda if you want to get soft Jamuns. If you add more the jamun balls starts to disintegrate while frying. Adding milk powder in this recipe is optional but squeeze well the bread slice dipped in milk. Health watchers can avoid milk powder or you could replace it with fat free milk powder too. Adding rose water is also optional as it can also be avoided. Gulab jamun with bread?! This I must try out! :) looks really soft and delicious! Does it double after soaking Lincy ? I would like to try this recipe. Is baking soda not necessary here ? 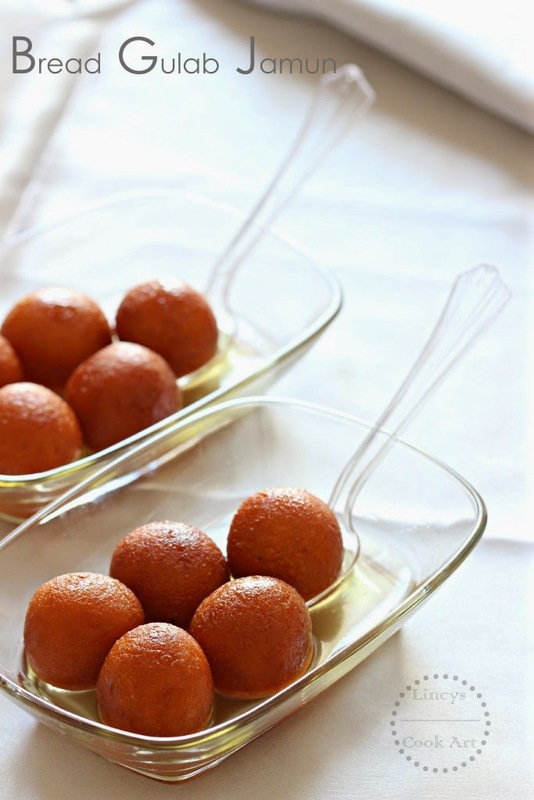 Bread gulab jamun looks delicious! Nice clicks! Can we use ghee instead of oil? You can use but i prefer oil for health reasons. Wow they look perfect... Lovely recipe dear.